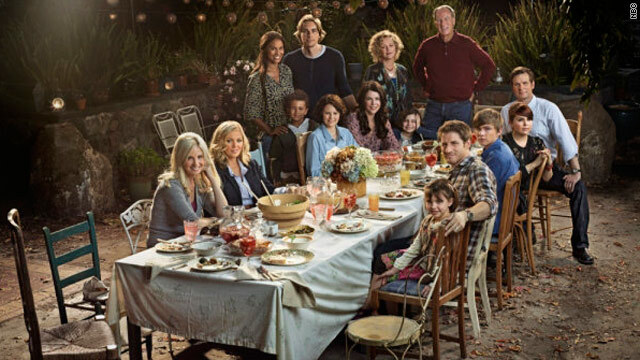 The title of last night's episode of "Parenthood" is "No Good Deed," as in "no good deed goes unpunished," and that was certainly the case for the Bravermans. Trying to be nice didn't get them anywhere. Last season, Adam and Kristina made friends with the Lessings, another family with a child on the autism spectrum, and Mrs. Lessing arrived at their door in tears. She’s getting divorced, partially because Mr. Lessing says the Mrs. is obsessed with raising their son Noel. What he calls “obsessed” I think most people would call parenting. Then Mr. Lessing showed up at Adam’s job, also in tears. Having acquaintances split up is bad enough, but Kristina seemed to be unnerved by the idea that caring for her son could put a wedge in her marriage. That's probably why she agreed to watch Noel after school and sat and listened to Mrs. Lessing cry for a couple of days. It also led to the best scene of the night: Adam walked into his house to find Max shaking a noisemaker in the corner, Noel jumping on a trampoline in his living room and Kristina comforting Mrs. Lessing, who was crying in their kitchen. Without saying a word, he turned around and walked back out. Can’t say I blame him. Sarah was freaking out about the internship Adam arranged for her, and he assured her that expectations were low, which is not the greatest big-brother pep talk I've ever heard. Later, she came into his office and started yammering about what morons are on the design team before she noticed Boss Baldwin. Boss Baldwin, on the other hand, definitely noticed her, which Adam definitely saw. Baldwin informed Adam his sister is “awesome” in a sing-songy voice - that's not going to be good. Meanwhile, Jasmine and Jabbar came back. Actually, she’s back for a quick visit because she’s made the European tour company for Alvin Ailey. She planned to leave Jabbar with her mom, Renee, but Crosby insisted (as he should) that his son should stay with him. I love that he didn't hesitate about it; he’s come a long way from being freaked out by the prospect of having a kid. He’s got another thing to worry about with Renee. She didn't like the idea of her grandson living on Crosby’s houseboat, and it seemed to be way beyond “grandma wants the best for her grand-baby.” I thought after the birthday party incident last season where she found out Crosby didn't really abandon her daughter and grandson, that she would have warmed up to him. Jasmine stopped by Crosby's studio to talk about her mother’s concerns, and Crosby called her on it (again, as he should). They had a big fight, but they did make up...albeit only after Crosby agreed that their son should stay with Jasmine’s mom. I understand not wanting to make trouble, and it’s good that he could see how his bachelor pad houseboat isn’t the best place for a kid to live, but there is going to be more trouble with Grandma. I think he needs to hurry up and let Jasmine and Renee know he's not going to give in on every decision made about Jabbar. What do you think? Should Crosby keep quiet until Jasmine gets back for the sake of peace, or should he speak up now before Renee starts thinking she's running things? At first, I wasn't happy with Jasmine either, especially everything that she's done thus far to Crosby (keeping the child away, telling her family he abandoned her, taking off to NY); but then again, whatever she did in the past, she normally counted on her family to help with jabbar, so i guess her situation now is no different. I was happy that crosby stood up for himself, he has grown. My favorite scene of the night came in the very end, when Adam surpised his family and came to dinner. the look on Kristina's face was priceless. Thanks for another great episode!